Dr. Vali was born in India and raised in Connecticut. 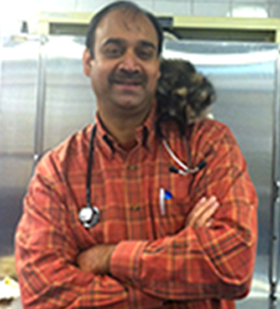 He received his DVM from Ross University and did his clinical work at the University of Illinois. His journey began at Mt. Pleasant Hospital for Animals in 2003 working alongside Dr. Brian Silverlieb as an associate. He took ownership of the hospital in 2010. Since his leadership, Mt. Pleasant has grown to a new height of compassionate care for our patients. 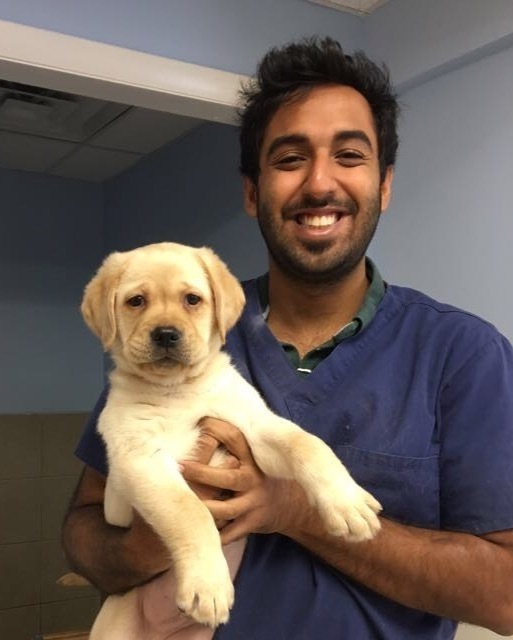 While he is particularly known for his canine reproduction and surgical expertise, Dr. Vali performs a broad spectrum of diagnostic testing and soft tissue surgery for his general practice. His extraordinary skills and intuitive powers regarding veterinary medicine and surgery have won him intense loyalty throughout the community. His practice thrives because of the unquestionable confidence and passion with which he treats each and every animal. Dr. Vali is consistently sought out for his expert advice for various canine reproduction related issues. He has received advanced training in artificial reproduction and is certified in Trans cervical Insemination by Minitube America. He has been involved with breeding and showing Great Danes and Labradors and has many champions to his credit. His passion and talents for high quality veterinary care has awarded him the highest recognition within his profession. He has a number of published articles, as well. Dr. Mangold graduated from the University of Maryland with a bachelor’s degree in Animal Science. She attended the Virginia-Maryland Regional College of Veterinary Medicine where she was awarded her Doctorate of Veterinary Medicine. 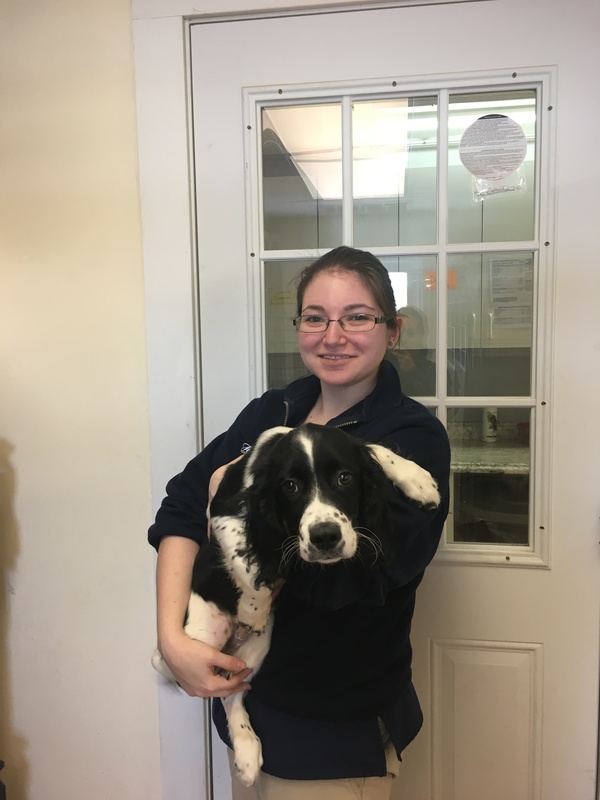 Dr. Mangold continued her clinical training during a 13 month internship in small animal medicine and surgery at the Angell Memorial Animal Hospital in Boston. 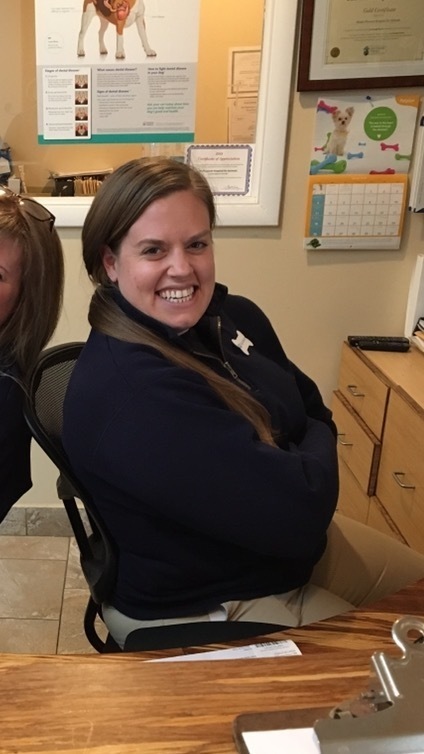 After working in private practice in Connecticut for two years, she followed her passion for zoo and aquarium medicine. She completed a three year residency in zoo medicine at the Wildlife Conservation Society/Bronx Zoo. After her residency, she worked for Walt Disney World’s Animal Kingdom for four years, and then returned to the Bronx Zoo for another three years. In 2003, Dr. Mangold returned to Connecticut and is currently on staff full time at Mystic Aquarium! Dr. Bakewell joined our team in 2014 as an associate. 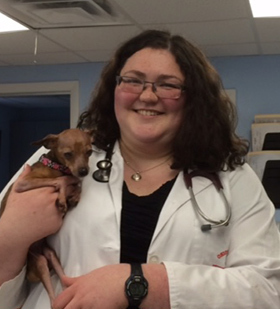 She graduated veterinary medicine from The Ohio State University. She was raised in New Milford with her mother, father, and younger brother. Dr. Bakewell currently lives with her husband and two cats, Francois and Mia. They enjoy visiting historical monuments and reading a good book! 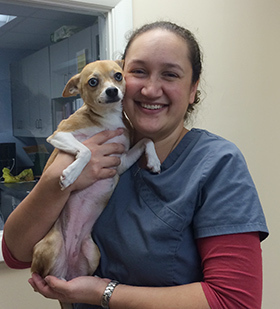 Dr. Nadja Raver joins us from Mamaroneck Veterinary Hospital where she has worked for the last 14 years. She has a B.S. In Biology from Brandeis University and her Doctorate in Veterinary Medicine from Ross University School of Veterinary Medicine. She has a strong interest in community medicine and spay neuter services. She has worked for the ASPCA, New Rochelle Pet Rescue and several mobile clinics providing low cost spay and neuter services to the public. As a personal quirk she likes Star Wars, Star Trek and 80s movies and can often be found singing along to country music. Nadja lives in Sandy Hook with her husband, two sons, three Bouviers, a blind Poodle-Dachshund and a temperamental Chihuahua. 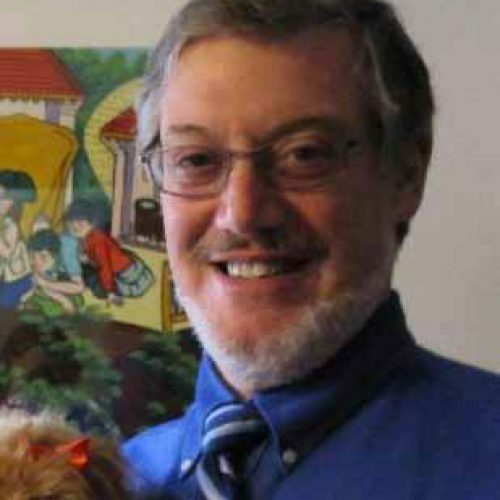 Dr. Brenner graduated from from Iowa State University in 1982. 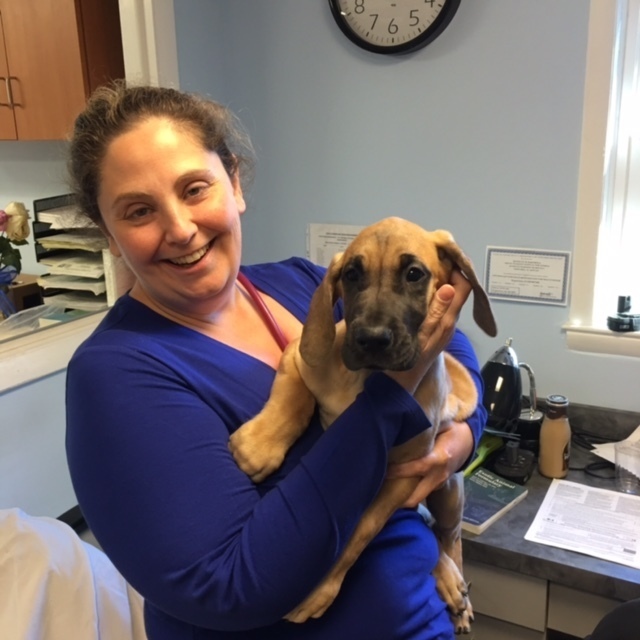 Since 1983, Dr. Brenner has been practicing veterinary medicine in Connecticut, where he developed an interest in diagnostic ultrasound. Dr. Brenner has worked for Veterinary Multiimaging and eVet Diagnostics for over 10 years. Dr. Brenner is available to perform on-site ultrasound studies for veterinary practices in Westchester, Putnam, and Dutchess Counties in New York, and Fairfield and Litchfield Counties in Connecticut..
At home, Dr. Brenner enjoys spending time with his wife, 5 children, and 4-legged family members. Nina was hired in 2007 as receptionist and office manager for Mt. Pleasant Hospital. She is a graduate of Norwalk Community College. She has had a great love of animals from the time she was a child, much to her parents distress! After going through several types of animals, including a cat that tore up their house, they gave in and got her first dog, a beagle/terrier mix named Cleo, and the love affair grew. She currently shares her home with two rescued Beagles, Haley, and Micah, as well as a guinea pig named Merlin and a bird named Rosie. Her daughter Kristen has inherited her love of animals and shares her life with rescued Beagle Tessie and her horse Dylan. Nina spends her spare time training Haley for competition in obedience and rally obedience. She is also a certified as therapy dog who visits nursing homes and schools. Micah is a special needs dog, being blind, but he loves to learn new ricks and will try and do some rally in the future. She also enjoys horseback riding, gardening, painting and cooking. Working at Mt. 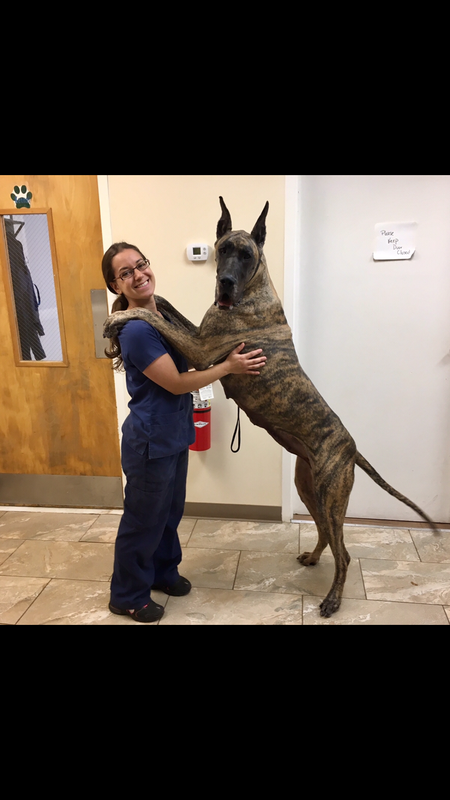 Pleasant Hospital has given her a great appreciation for the work that veterinarians do and enjoys working with the clients and their awesome pets! Laura joined the Mt. Pleasant family in 2017. Before joining our family, Laura has 11 year of experience in Pet retail. Laura's favorite part about Mt. Pleasant is her wonderful teammates. She shares the passion on building trust and relationships with our clients. Laura also enjoys learning and seeing the treatments of the animals. She lives at home with her fiancé and their lovely cat named Leo who she rescued from DAWS. Laura is the youngest is three and the only girl. She is very close with both of her parents and soon to be in-laws. In her spare time she continues to learn about the medical side of the industry.Auras hobbies also include spending time with her fiancé and outdoor summer concerts. When Laura was younger she tap danced for 14 years and loved it. Sally came to Mt. Pleasant in 2017. Sally went to UConn where she studied agriculture and natural resources. While working at Mt. 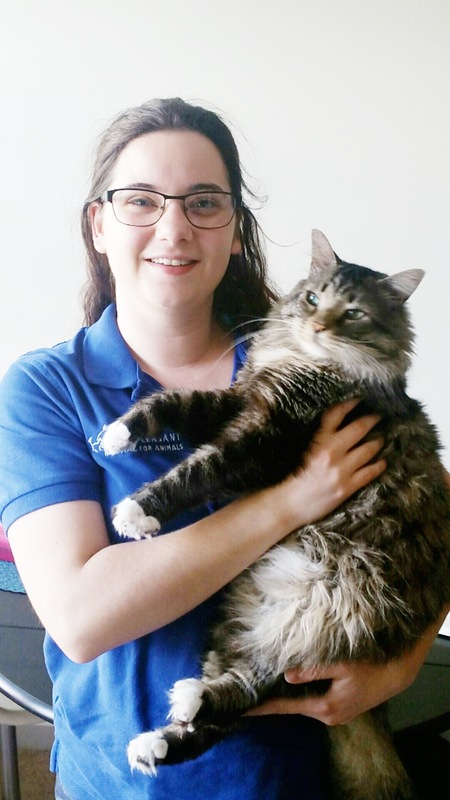 Pleasant, her favorite things are getting the chance to work with the excellent clients and helping all the wonderful animals that come through the doors. Sally also loves the great privilege it is to work with such an amazing team of people. Sally loves and owns a terrier mix named Finn. In her spare time, Sally enjoys to read, cook and check out craft beers and breweries with her boyfriend. Sally loves horses and to ride them. She also volunteers at the CT Draft Horse Rescue. Sally hometown is Simsbury, this is where her parents are. She also had a younger sister who lives in NYC. Sally also loves to just relax on the beach but can also enjoy winter weather. She says" the colder and snowier the better!" Sally is a country girl that loves the city living. She lived in Philly for a number of years and was an Adoption Counselor at the PSPCA. Ashley joined the Mt. Pleasant family in 2016. Ashley really enjoys working with all the different clients and seeing some of their companions transition from sick to healthy. She loves to form great bonds between herself and the clients. At home Ashley has her dog Buffy the beagle and 3 different types of geckos. Ashley comes from a small family based on both the west and east coasts. In her spare time she enjoys a good book and archery. Debbie has been with the Mt. Pleasant family since 2017. She has taken some class at Purdue University for Veterinary Technician. Debbie has a good size family of two and four legs. Her family includes her 3 children Ashlyn, Ethan, Garrett and her granddaughter Hailey. For her 4 legged kids that includes Alys the thoroughbred mare, Addy the Quarter horse filly, Rosie the German shepherd, Penny and Annie the Labradors, Tippy the domestic longhair cat and Gumball the domestic shorthair cat. 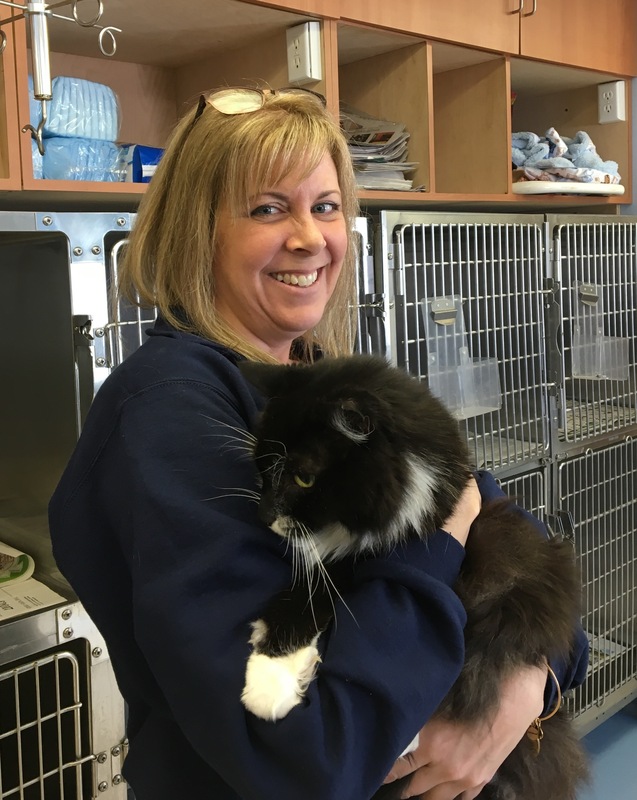 Debbie enjoys meeting everyone at the clinic and getting to the clients to help all their animals. 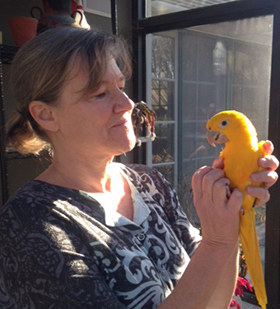 When Debbie is not at the clinic she enjoys spending as much time outside as possible. She also has interests spending time with her kids, breeding Labradors, and hunt seat horses. Mary is the senior member of our team, having been with Mt. Pleasant Hospital for 10 years. She received her training under the guidance of the hospital founder, Brian Silverlieb, VMD and now acts as our head technician. Mary grew up in an agricultural atmosphere and graduated from Nonnewaug High School from their vo-ag program. She was also very active with 4-H and Future Farmers of America. 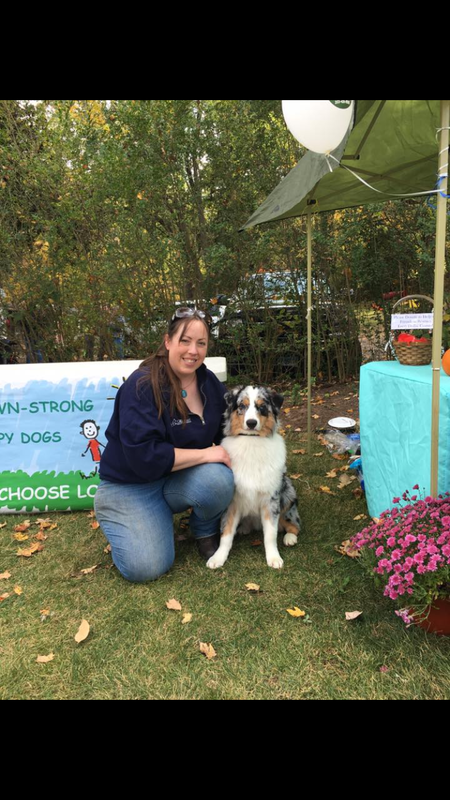 Mary has established a breeding program with Australian Shepherds and shares her home with Travis, Tala, Munchkin, and Koz. She also has a collie named Sky and 2 cats, Jojo and Tuffy. She has shown horses most of her life as well and currently owns an Appaloosa mare named Fancy and a Quarter Horse named Babe. Her dog Travis is also a certified therapy dog. Mary has always enjoyed the hands on aspect of her job and as one of Dr. Vali’s main interests is reproduction work, has continued her education and experience in that field as well. In her spare time she enjoys horseback riding, showing dogs, and many artistic pursuits such as sculpting and painting. Kristen started with us in December 2015. She has 10 years experience in the veterinary field. Graduated from Sacred Heart University with her biology major and her bachelor of science degree. Starting in March 2017, along with Dr. Kate Bakewell, she will be starting her certification classes for physical therapy. At home, Kristen has her husband Justin and her 3 year old daughter, Adelina. They also have two great cats, Luka and Anna. What Kristen enjoys most of the job is the clients. She gets the opportunity to help a wonderful bunch of people everyday. Also the team she works with is filled with compassionate and hard working people. Kristen says " We are encouraged to grow in our careers and find new ways to help the animals we care for." She also enjoys learning about the reproduction aspect which is very new to her. She finds it fascinating. In her spare time she enjoys hiking, going to the beach, sewing, and knitting. If Kristen had to ever have another job in her life time, she would very much like to get the chance to be a stunt driver. 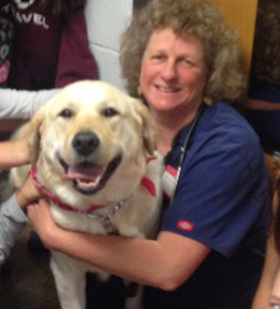 Janet is our veterinary technician who has been with Mt. Pleasant since 2011. She graduated from the University of Maine at Orono and is a licensed technician in the states of New York and Connecticut. Her love of animals is reflected in her family pets; their “crazy” Labrador Retriever Daisy, cat named Calvin, Tiny and Winter two small dogs and pocket pets Snowy the ferret. Her human family consists of her husband Doug and two children, Jackie and Tommy. They enjoy an active life outdoors and a love for all the seasons of New England. Janet has hiked sections of the Appalachian Trail and canoed the Allagash River! JJ joined the Mt. Pleasant team in 2017. He has studied and received his Bachelor's of Veterinary Science & Animal Husbandry (BVSc & AH). He is currently underway of becoming a Veterinarian. JJ was born and raised in India. His parents currently still reside in India whereas he has a sister who lives in New York. He says his favorite part about being apart of the Mt. Pleasant family is getting to work with so many different types of animals and working alongside with a wonderful group of people and mentors. Each day is a new adventure here and He has learned so much from the doctors and technicians here. Currently has no pets, but he will one day. JJ in his spare time enjoys outdoor sports such as Soccer and Basketball. He recently learned how to snowboard and look forward to more snowboarding trips! Some of his other interests include Hiking , and trying out new foods. A fun fact not everyone knows about JJ is he loves cooking and experimenting in the kitchen. That he hopes to one day open a restaurant or food cart. Claire interned with us during her junior year of high school and became a technician assistant in her senior year. After her freshman year of college she made the choice to devote all her attention on her academic career. Claire then went on to graduate SUNY Oswego University with a degree in Zoology. Now she is back with us as a veterinary assistant and we are very pleased to have her! Claire is the oldest of four siblings, her middle brother is in the marines and her youngest brother and sister are twins. She lives with her parents and their family hunting dog, Carolina, an Irish Setter. In college, Claire enjoyed learning about and participating in falconry. She is also a very skilled artist who enjoys drawing and sketching when she can. On a nice day Claire enjoys a good hike and bird watching! Theresa started with Mt. Pleasant in 2011 as a kennel attendant. She is a graduate of Newtown High School and attended Southern Connecticut State University. She lives in Newtown with her mother, sister, and their family dogs, including her own, Tehya, a Labrador Retriever. She has learned the art of breeding and started breeding Labrador Retrievers. 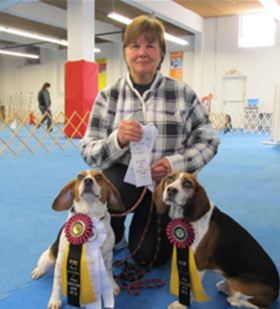 Theresa's role has grown over the years, caring for not only our client's pets, but also for Dr. Vali’s show dogs. She trains with them to get ready for shows and sometimes will even show them herself! Theresa participates with Tehya as well for obedience and breed competition. She also will often assist with the reproduction work and helps the technicians with medical procedures. 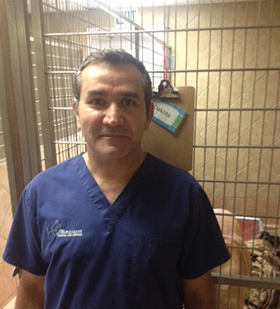 Carlos cares for our boarding animals and oversees the maintenance at Mt. Pleasant. He has a special way with all of the animals and also assists our technicians when an extra hand is needed. He shares his home with his wonderful wife and two adorable daughters, who are the light of his life. One of his favorite pastimes is playing soccer and watching sports with his family and friends. Carlos enjoys getting to know our boarding pets and learning their different personalities! He handles most of the more difficult dogs with ease and his calm demeanor makes boarding less stressful for them.